Financial statistics from SharePad and non-financial data from the company itself all indicate Motorpoint is no ordinary car dealer. If you’ve bought a vehicle from the company, or read its annual reports, you’ll probably know why. 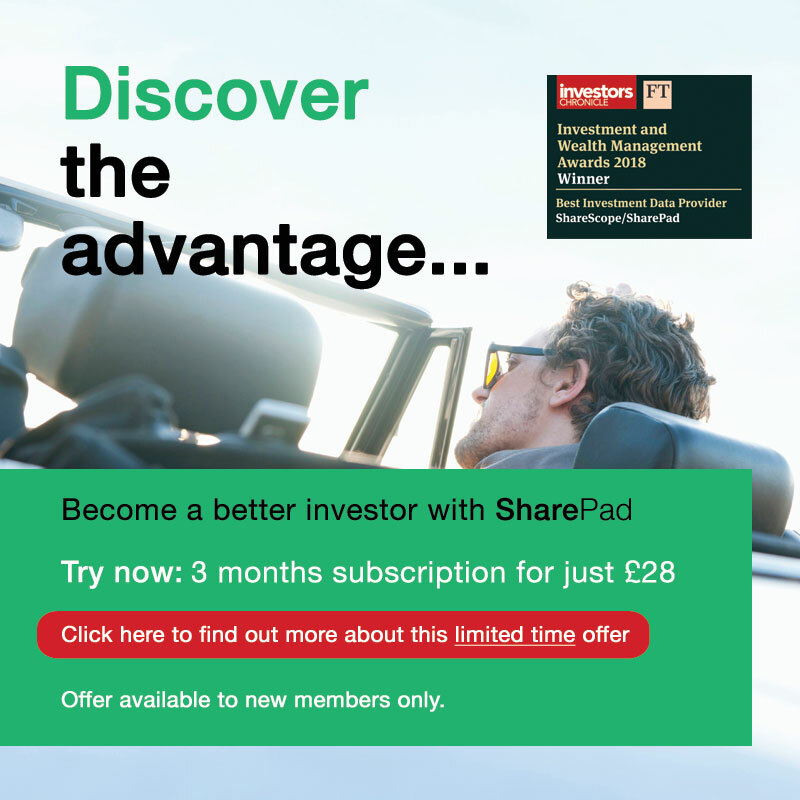 My article on Electrocomponents showed how I find most of my investing ideas with the simplest of SharePad filters, one that dredges for profitable companies that have recently published annual reports (as long as they are not miners or banks). New ideas can come from anywhere though. A reader brought my attention to kettle component manufacturer Strix, and I’m interested in Motorpoint for perhaps the best reason. We bought a car there last year, and as I write this article, my son is buying his first car. If it were up to me, he would buy it from Motorpoint. It appears I’m a loyal customer. Let’s see how Motorpoint stacks up against other car dealers in SharePad. I might like being a customer, but if the company does not perform well, or the shares are expensive, it is not going to make a good investment. To find companies like Motorpoint for comparison, I created a new Setting in the blue List view in SharePad (click on the Setting menu at the bottom of the view), and added columns (click Add column in the menu above the table) for a few vital statistics. Once you have saved a new setting you can apply it to any list of shares. One of the columns I added was Subsector. To find motor dealers, I sorted the whole London Stock Exchange by subsector and checked the descriptions of the shares in Motorpoint’s subsector–Specialty Retailers–by glancing across to the Summary section of the Company page on the green side of the split screen (see image below). It is easy to jump from one company in a list to the next by hitting the spacebar, so going through the whole subsector only takes a couple of minutes. To get the motor dealers on their own, I added each one to a new portfolio (Click the Add to port button above the table). It was by far the most profitable company in its most recent twelve months. Return on capital and cash return on capital employed are about three times the next best company (which in both cases is Inchcape). That could be a one-off, but it could also be a sign that Motorpoint is a better business. It may be slightly more dependent on external finance than average, but debt (gearing) doesn’t look especially high. Motorpoint may be more highly geared and less profitable than it seems though, due to an accounting quirk. Like many motor dealers, the company finances stock by borrowing against it (so-called stock finance), a transaction that is not classified as ‘borrowing’ in its balance sheet (it is accounted for as payables). If we treat stock finance as borrowing, which I think is prudent, gearing shoots up to nearly 80%, although the interest rate is so low the company’s interest bill is only a small fraction of operating profit. 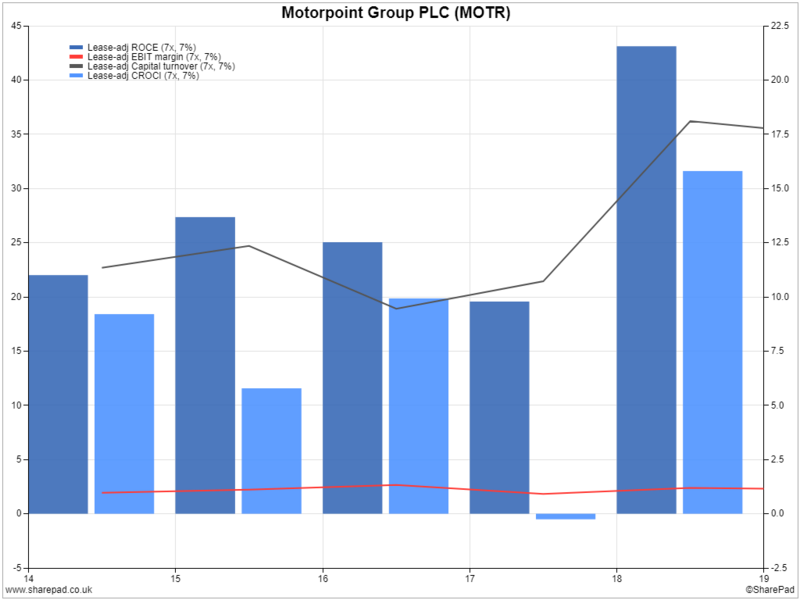 Return on capital employed, by my calculation, was about 20% in 2018, a little above Motorpoint’s three year average, which is still very impressive. Perhaps not surprisingly, traders look on Motorpoint kindly. Its debt-adjusted price earnings ratio is the second highest of the group, although a multiple of 12.8 is hardly demanding if it can sustain high levels of profitability. The red line though, profit margin, may be a cause for concern. Motorpoint makes relatively little money from each car sale, but it sells huge volumes of cars. This works very well when people are in the mood to buy but cars are expensive and when economic conditions falter, people hang on to their savings and think twice about car loans. When volumes fall, so may prices as Motorpoint seeks to clear stock, and that could have a profound effect on profit. We saw this in the half-year to September 2016, when the UK voted to leave the EU. Fearing a fall in consumer confidence, management reduced prices to stimulate demand. That meant Motorpoint made even less money on each sale, and operating profit fell 32% compared to the previous half-year. Demand recovered quickly but a sustained reduction in consumer confidence could have a bigger effect. Wearing my very long-range specs I worry about consumer debt and the future of car ownership. Most cars are bought using finance, which probably exaggerates the natural cycle of car sales. A popular vision of the future of transport is one in which more people rely on fleets of shared (maybe even autonomous) vehicles. The shift from ownership to pay-as-you-go and rental may already be happening in cities with the rise of companies like Uber. So far, my fears about forces outside Motorpoint’s control have prevented me from investing. I feel frustrated because my knowledge of the factors in Motorpoint’s control make me think it should be an excellent investment. I like Motorpoint because it fulfils a need. For a large part of the population, buying a car is stressful. We’re spending a lot of money on a complex piece of machinery that we cannot evaluate for ourselves. New cars are particularly expensive but relatively low risk. Used cars are more affordable, but we’ve all heard stories about people who’ve bought lemons. Most of us aren’t natural hagglers but we know most car dealers will negotiate. Unlike its listed rivals, Motorpoint is a car supermarket. You can buy most brands of car from a vast range at the prices advertised on windscreens. There’s no haggling. Key to this relationship is trust, the customer needs to be confident they are not buying an overpriced lemon. Like most car supermarkets Motorpoint establishes trust by not going for the hard sell. You can wander around and test drive at your leisure. It also heavily promotes high customer satisfaction scores, and supplies a range of documentation to verify the car is sound. I think the business model is gathering momentum, and while there are other car supermarkets, Motorpoint is distinct from them too. It is the biggest by some distance, and it is the only one of its closest rivals to restrict itself to selling nearly new cars, almost all of which are still under the manufacturer’s warranty. This further reduces the probability and repercussions of buying a lemon and gives Motorpoint purchasing power. Statistics from the company support the claim Motorpoint is trusted by customers. Fifteen percent of buyers commit to a purchase online without first seeing the car. Twenty-six percent of customers in the year to March 2018 had bought from Motorpoint before. The company has a very high net promoter score of 77% (how likely a customer is to recommend the company to a friend or colleague). Motorpoint operates twelve sites. It expects to open at least one more a year with a medium-term goal of twenty. Things outside Motorpoint’s control aside, I think it is perfectly set up to achieve this. Though I might need to watch it prosper through a recession before I buy the shares, I rather hope that one day I might.